Welcome back to the Funvee Tailgate BLOG, The THUNDERBLOG’s Weekly College Football Series. If you noticed the emphasis on “BLOG,” that is because we also have the Funvee Tailgate Podcast that ties into the blog series. Here’s the iTunes link to go subscribe. For those newer readers, the blog version of the Funvee Tailgate looks at the full slate of Top 25 FBS teams along with a few other selections. Week 5 is giving us a nearly full scoop of conference showdowns and with it, the race to the CFP becomes a bit more linear. Take the road to the conference championship step by step and make sure not to look ahead because that’s when you can trip up. LET’S FIIIIRRRREEEE IT UP! Miami took care of UNC pretty handily on Thursday night winning 47-10. The turnover chain was alive and well for the Hurricanes as they forced three fumbles and three picks, taking two back for touchdowns. The Canes find themselves in an interesting position as the Coastal Division looks like it might be a tougher road than originally thought. If Miami runs the table, they put themselves in a position to become a CFP team. That’s a lot of looking ahead and it’s not even October 1st yet, better take off the tin foil hat. I do want to quickly highlight #3 Clemson hosting Syracuse before I get into the bulk of my picks. The game is obviously a revenge game for the Tigers after losing at Syracuse last season. Cuse has been solid all season and features a solid QB in Eric Dungey so Clemson’s defense will need to reach the potential we thought they’d have if they want to make sure Syracuse doesn’t make it two-in-a-row. Returning to Death Valley gives the Tigers a much bigger advantage, though. #12 West Virginia (-3.5) at #25 Texas Tech at noon on ESPN2–With an over/under of 72.5, this game is going to be a main-lining of offense you never knew you needed. Tech comes in having upset Oklahoma State last week and now finds themselves ranked and hosting WVU. Both teams have solid QBs, although WVU’s Will Grier is better, however, the difference maker will be WVU’s defense being sharper than the Red Raiders. WVU wins and covers. #18 Texas (-8.5) at Kansas State at 3:30 on FS1–“Texas is back,” is back! The Longhorns hit the road to face a Kansas State squad that should not be slept on at home. KSU’s defense isn’t stifling as we’ve come accustomed to in the past and Texas’ has been pretty solid the last couple weeks, but the Longhorns haven’t left Austin once. Texas wins but doesn’t cover. #14 Michigan (-14.5) at Northwestern at 4:30 on FOX–I’d love to be more excited for this game, but sadly, Northwestern hasn’t been that exciting of a team in 2018. Wisconsin losing to BYU two weeks ago was only the tip of the Big Ten’s terrible Saturday iceberg as NW lost to Toledo. Michigan is getting more-and-more offensively as the weeks go on as their defense continues to be a brick wall. Wolverines win and cover. Florida (+7) at #23 Mississippi State at 6:00 on ESPN–Flordia HC Dan Mullen returns to his former program with a solid squad as both teams are 3-1 having both lost to Kentucky (go figure). The over/under of 49 is an incredibly intriguing play as both teams have solid QBs and defenses that have been at times stonewalls, and turnstiles at other times. Miss St is in a need of rebound and beating up on their old ball coach might be the medicine they need. Bulldogs win and cover. Virginia Tech (+4) at #22 Duke at 7:00 on ESPN2–That’s right, Duke is favored in this showdown as both teams will be starting backup QBs. Neither backup looked that solid in their relief efforts so the running back game will become an X-Factor. Duke runs with a stable. Blue Devils win and cover. #4 Ohio State (-3) at #10 Penn State at 7:30 on ABC–The first of three landscape defining games in the Big Ten East, the other two will be these teams playing Michigan, both schools come in with howitzer offenses. OSU QB Dwayne Haskins will be on full display at Happy Valley. PSU’s Trace McSorely will need to put in the performance of the century if the Lions will pull off the upset once again. Ohio State wins and covers. South Carolina (-1.5) at #17 Kentucky at 7:30 on SEC Network–Kentucky finds themselves in the Top 25 after a stellar first third of the season. UK RB Benny Snell is slowly but surely putting himself into Heisman categories and this game could propel that narrative. The Wildcats pass defense will be tested as USC QB Jake Bentley could have himself a big night but the front seven from Kentucky will keep him pressured. Kentucky wins outright. #7 Stanford (+4) at #8 Notre Dame at 7:30 on NBC–Hand up. I was dead wrong about the Irish last week. Bryan Kelly’s decision to change quarterbacks paid off big time and now the ND offense is chugging along. Stanford’s is the opposite. Instead of preseason Heisman favorite Bryce Love being the nucleus of the offense, QB KJ Costello has been outstanding while Love has been rather unseen. The defenses will need to hang on this game will turn into a shootout but the Irish roll at home. ND wins and covers. #20 BYU (+17) at #11 Washington at 8:30 on FOX–BYU is going to try to keep the same low scoring and shutdown Washington’s Jake Browning. BYU has done that in each of their wins and Washington’s offense hasn’t exploded just yet and I don’t see them exploding to a victory here. Washington wins but doesn’t cover. Ole Miss (+9) at #5 LSU at 9:15 on ESPN–Ole Miss has a high flying offense that comes into Baton Rouge to face the stone wall Tiger defense. The real key will be LSU’s offense putting points on the board at the pace that Ole Miss potentially can. LSU’s should be there pacemaker, however. Tigers win but don’t cover. 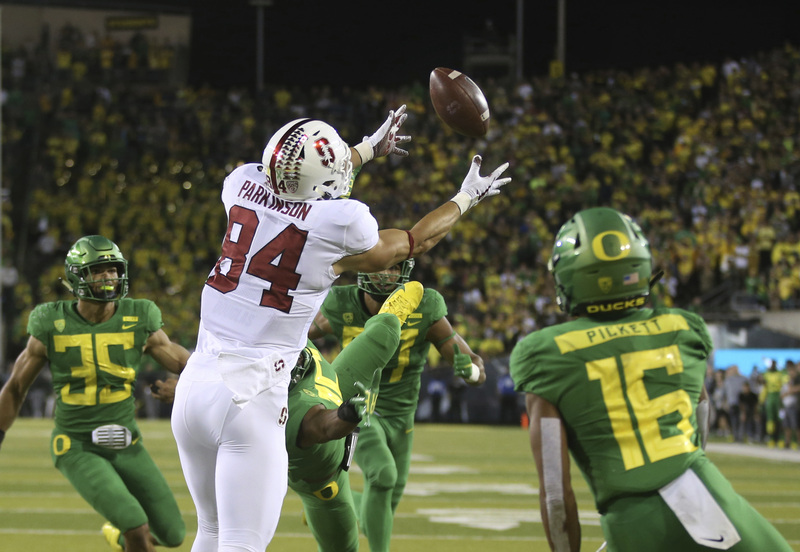 #19 Oregon (-2) at #24 Cal at 10:30 on FS1–Oregon is out to avenge their loss to Stanford last week. Justin Herbert is poised to have a monster night and tear up a fairly solid Golden Bear defense. Ducks win (BIG) and cover. My Lehigh Mountain Hawks are a bye week after losing to Penn last weekend here in Philadelphia. Let’s hope HC Andy Coen is getting the Mountain Hawks back into shape for Princeton next week and the Patriot League schedule after that.